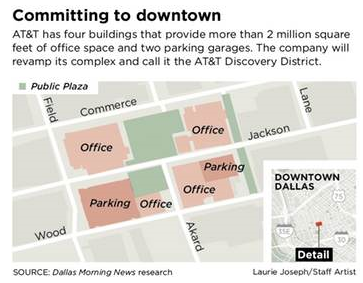 ​​DALLAS - After months of speculation that it might leave downtown, Dallas’ largest business—telecom giant AT&T Corp.—says it will stay in its headquarters on Akard St. and spend millions of dollars on a reboot. The company also says it intends to add more than 1,000 workers downtown over the next few years. AT&T has more than 2 million sf of facilities along Akard St. in buildings built between 1929 and 1984. AT&T plans to upgrade its pedestrian areas, adding landscaping, lighting and other features in addition to adding more restaurant and retail outlets, an outdoor event space and public art. It’s calling the complex the AT&T Discovery District. The company expects all the improvements to be a multiyear project.